System crashes caused by bugs in the Anthem video game have led Sony to offer full refunds to players. Many people reported on social media that a serious bug had led to their PlayStation 4 console switching off. When the machine rebooted it warned of possible memory corruption and other problems if such an abrupt shutdown happened again. Sony was quick to give “full refunds” when asked by gamers worried by the crash. Anthem is a squad-based, science-fictional shooter that challenges players to defeat a series of enemy aliens or “exos” using the offensive capabilities of an armoured, flying suit called a Javelin. 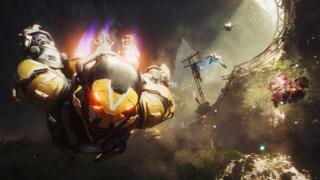 The discussion forum on social news site Reddit that has sprung up around the widely anticipated Anthem game has a long thread collecting reports of gamers hit by the “scary” crash. Many reported that Sony had given refunds for digital versions of Anthem with “no questions asked” when users had complained and mentioned the system crash. The consensus in the thread lays the blame on an update issued last week but opinion is divided about the sequence of events that triggers the power down. Some gamers reported that it did not strike if they manually turned their console off after playing rather than leaving it in a suspended mode. Neither Sony, nor Anthem-maker Bioware have issued a public statement about the bug and its origin. However, Bioware engineers have responded to complaints in the game’s official forums, where they said they were “hard at work” on a fix. Anthem publisher EA has also reportedly asked for help to diagnose the bug and its causes. In a tweet, Jesse Anderson, global community manager for Anthem, said it was collecting information about crashes while readying the patch. “Some issues will be addressed faster than others, with hot-fixes, others require a client update, which take longer to get ready,” he wrote. The serious crash reports have added to the generally negative reception Anthem has received since it was released in late February. Players have called the game “grindy” as it requires them to repeat simple quests and missions to improve their character. There have also been complaints about how short the game is and the lack of decent rewards for those that have stuck with it.